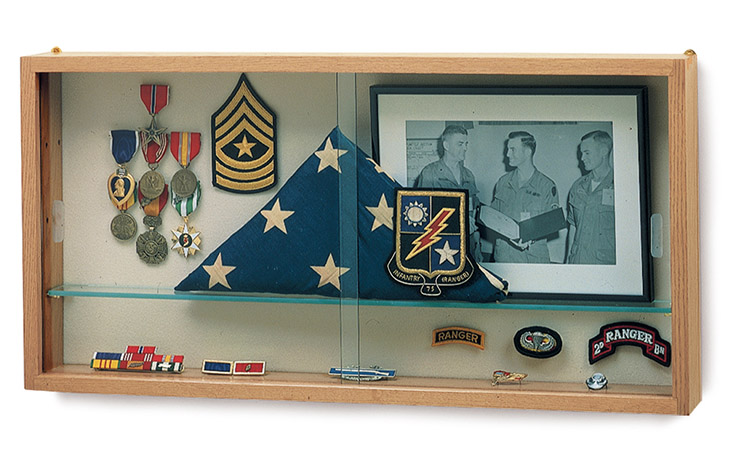 Our compact collector's wall display case was created specially for protecting collectibles and cherished keepsakes. It includes three glass shelves that can be removed to fit your exhibit needs. The interior background is plaque fabric for attaching awards or other momentos. Case frame is finished in a beautiful Natural Oak. Features removable sliding tempered glass doors. Measures 30"W x 3-1/2"D x 15"H overall. Shipping weight 21 lbs. PRICE INCLUDES SHIPPING! Please allow 2-3 weeks for delivery.